Another Long Walk: Let the Hike-A-Thon Begin! But finally, yesterday, I actually did some hiking. Nothing major. Basically, I wanted to check up on some of my letterboxes and at least get a few miles in. Turns out, my few miles have had some interesting surprises along the way! Technically speaking, I wasn't "hiking" when I took this photo. I was walking along some railroad tracks here in my hometown of San Luis Obispo, headed to my mom's house when I saw this coyote. It's not every day I see one of these things. In fact, I wasn't even 100% certain this was a coyote because I'm so unfamiliar with them, but I knew it wasn't a cat and I knew it wasn't a dog. I suspected a coyote, though, and took this photo to look it up online. It appears that I was right. Ha! =) I have seen coyotes before--or at least suspected coyotes, but they've always been at night and as soon as they saw me, they ran off into the brush. This one was remarkably friendly and stood here just watching me, and in broad daylight no less! I hope nobody nearby has let their cat run loose. But that was pretty exciting. 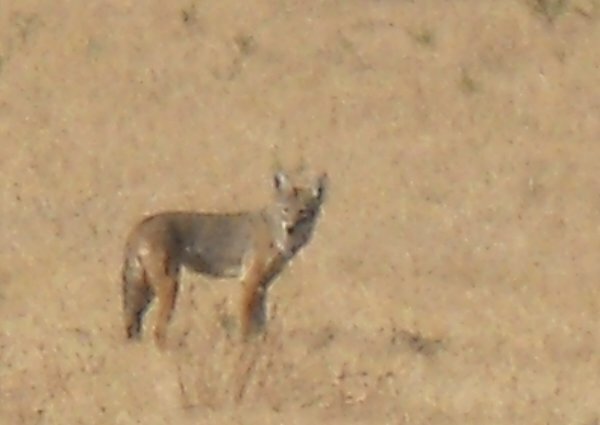 It's my first coyote photo. (I took it two days ago, August 4th.) =) Yeah, I know, it's a little grainy, but it wouldn't let me get any closer for a better image. I'm just glad I could get a recognizable photo! My favorite part of this hike was the bee hive. I've been watching this little bee hive for years--I went on a field trip here back in my college years for a natural history course and our teacher (Hi, Mr. Ruppert! but I know you'll probably never read this) pointed it out to us in 1994. When he pointed it out, though, there were no bees. Just honeycombs and it appeared the hive had been abandoned. 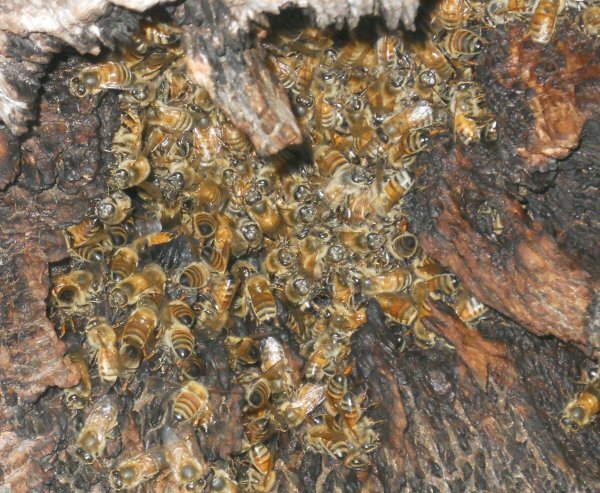 It stayed this way for probably the next ten years, then during a visit, I went to look in the hole in the tree to show a friend the old bee hive and--yikes!--there were bees! It wasn't so abandoned anymore! A couple of years ago, the tree the hive was in fell over across the trail. Due to the lack of maintenance on the trails, the tree is still across the trail blocking it. It's easy to step over, though, so it's not a big deal. If it was me logging off trees, I'm not sure I'd mess with this one. I'd imagine cutting up a tree with an active bee hive in it would likely piss off a lot of bees, and anyhow, I like the bees. I don't really want to disturb them. I hope nobody ever cuts this tree up--at least not until the bees decide to leave. I'm a little surprised that the bees stuck around after the tree fell. I'd imagine that was quite a shock for them and perhaps they'd think their home wasn't secure. But no, they're still hanging out in the tree. So I took my friend, Jenny, out to see my bees--but this time I decided to get some photos so I could tell y'all about the bees. Naturally, I don't want to get too close to the hive, and my first photos didn't turn out very well. I'm not sure if you've heard it or not, but bees are kind of small and don't photograph well from a distance. I inched closer and the photos were getting better, but it was late in the afternoon and the bees were in the shade. It would have helped to get a light on them, so I decided to try using my flash. I don't really know a whole lot about bees, though, and worried that a flash might rile them up. Jenny got quite a ways back--I think she was a little nervous around so many bees to begin with, and I asked her if she thought a flash would cause a swarm. "I wouldn't do it," she told me. She went off--probably not an unwise decision--but I suggested that she prepare to run.... "Just in case." "Run, Jenny! RUN!" I shouted. She didn't seem to take my exclamations seriously, however, and I walked over to where she was looking around trees for spots to hide a letterbox.